January flowers are few around these parts unless they’re flown in here from warm places like Africa or South America. It sounds crazy expensive to bring those posies from the other side of the Earth, where it’s warm when we’re freezing up in here. The only other chance we have of watching plants blooming during January in Pennsylvania is to keep indoor plants. We’ve enjoyed a few blooming the past couple months and that’s brought a sunny feel to the cold of Winter. Picked up an Amaryllis bulb for $5 at an after-Christmas sale and planted it in the beginning of January. Planting consisted of placing the included desiccated coir block in the bottom of the provided plastic pot and adding two cups of water. Once the growing medium was soaked, half of it was scooped to the side with one hand while the bulb was nestled into the pot with the sprout side up and the remaining soil tamped around it. These bulbs unfortunately have the common name Amaryllis, as they are members of the family Amaryllidaceae, but are more correctly called Hippeastrum. These Amaryllis bulbs are fun to watch. They grow so quickly it is truly amazing! We watched it grow up a couple of feet – literally! – over the next three and a half weeks. The linear leaves get over 20 inches tall and are thick and succulent. 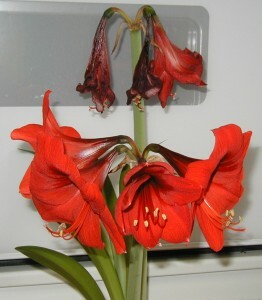 Three and a half weeks growth from a single Amaryllis bulb. Photo taken 28Jan2011. Bulb planted 5Jan2011. Flower stalks are more cylindrical than the leaves and one or more will appear after the greenery has grown up almost a foot tall. 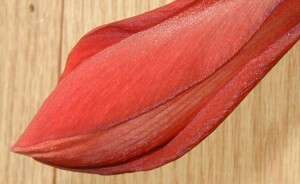 The flowering stalk on the left still has its blossoms wrapped up tight, while the other stalk has opened its capsule to reveal three flowers, one of which has opened up. Photo taken 30Jan2011. The huge, blade-like leaves are erect and continue to grow at this stage. The blossoms are gigantic, too. Big, beautiful red blossoms bigger than your hand. Photo taken 31Jan2011. The petals have a glittery gleam in the sunshine. Reminds me of the man-eaters in Lil' Shop of Horrors. Photo taken 31Jan2011. This particular bulb bloomed beautifully and it was the fullest that I’ve ever seen. There were two flowering stalks with three gorgeous red blossoms on one stalk and four on the second stalk. Four blooms packed into the head of one flower stalk. Photo taken 3Feb2011. 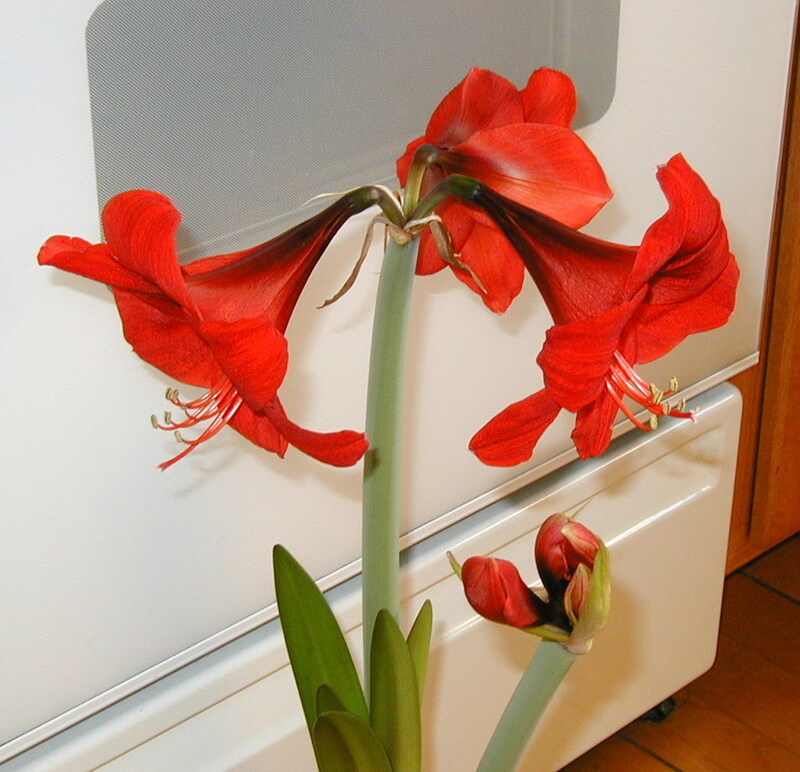 The Amaryllis flowering stalks are now as tall as the oven window. The leaves continue to grow. Photo taken 3Feb2011. 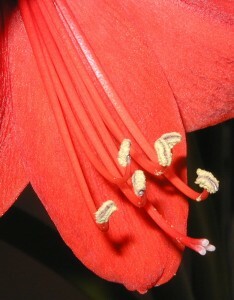 Seven Amaryllis flowers. Photo taken 3Feb2011. First flower stalk dying back while the second group of flowers are blooming in full. Photo taken 9Feb2011. 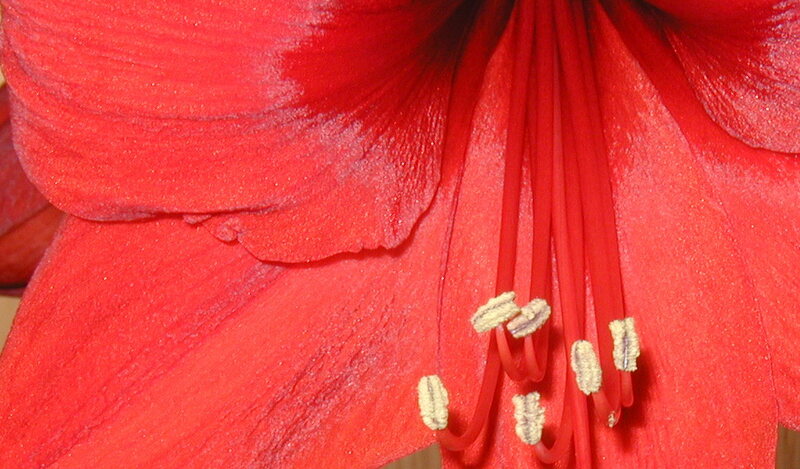 Pretty Amaryllis blossom with six powdery stamens. Photo taken 9Feb2011. It would be nice to keep this bulb for next year, but I’m not sure how. 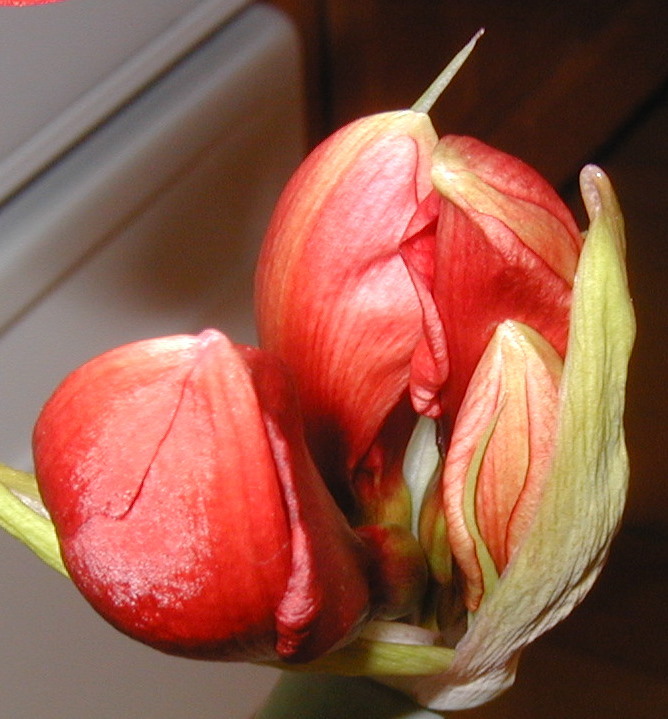 I’ve never successfully kept an Amaryllis bulb for the following year. Either I didn’t have a place to keep the bulb or I tried to keep it but had the wrong conditions. They either dried up or just didn’t bloom when they did re-grow. This year I plan to continue to lightly water the greenery and keep it indoors in bright room that receives filtered sun. The flower stalks had withered fairly quickly after blooming, so they were cut off at the base once they were dried out. Keeping the bulb watered in a sunny spot should recharge it with new food for next year. But for how long? Do I water it for the whole growing season? Should it be fertilized? When should it be stored for next winter so that we can take it out and watch it bloom again? Store it in a cool basement for how long? Should it have any cold storage, like refrigerator temperature for a time?